Within the SCTR, we have access to a 13,500ft2 vivarium. This area has the capacity to hold up to 140 large animals and 48 rabbits at a time. Further, the facility also has room for hundreds of rodents within the 3 rodent suites. Pre-procedural preparation is performed in dedicated large animal or rabbit prep rooms. Immediate post-operative care occurs in our 1,000ft2 recovery suite, which has the ability provide hemodynamic monitoring and ventilatory support. For post-morbid examinations, SCTR also provides a fully equipped necropsy room. The University of Pennsylvania under the supervision of the School of Veterinary Medicine provides peri-procedural care. Vivarium facilities are serviced and maintained by University Laboratory Animal Research (ULAR) organization. The laboratory contains three 300ft2 fully-equipped large animal operating rooms and one advanced hybrid surgical suite (see below). Each of these rooms is designed to perform complex cardiovascular surgery, including cases requiring cardiopulmonary bypass. Further, the facility also offers a fully equipped rabbit housing and procedural suite for small animal surgery. The Gorman Cardiovascular Research group employs a highly-qualified team of veterinary technians and anesthetists to assist our surgical teams. In addition to the three traditional operating rooms, the laboratory has a dedicated RS Axiom Artis FA Silver (Siemens Medical Solutions, Malvern, PA USA) universal floor-mounted C-arm angiography system with digital image chain which includes: a high-resolution full sized CCD camera in 10242 matrix; 100 kW angio HF generator; DR acquisition module, pulsed fluoroscopy; DSA acquisition module; DICOM network connection, Syngo user interface. This system is appropriate for coronary catheterization, catheter based structural heart repair and complex endovascular procedures. The imaging core consists of 1500 ft2 of fully interrelated work space that allows cardiovascular imaging data to be obtained from multiple technologies including: echocardiography, MRI, CT scanning, fluoroscopy and sonomicrometry. Data acquired from these imaging modalities are able to be analyzed off-line using our network of computers using the latest (or custom) analysis software. The laboratory has a dedicated 3T Trio MRI system from Siemens (Siemens Medical Solutions, Malvern, PA USA). This system is fully capable of performing the most sophisticated cardiac imaging exams, such as back projection perfusion and 3-D myocardial tagging in very short time intervals. The MRI system is exclusive to our laboratory, will be used exclusively for research and is available 24 hours/day. It is located less than 100 feet from our suite of operating rooms allowing for seamless transition from data acquisition in the operating room to data acquisition in the scanner. The laboratory has dedicated access to four Philips echocardiographic platforms – Sonos 5500 (2), Sonos 7500 (1) and IE33 (1). Both Sonos 5500 platforms are equipped with a standard array of 2D handheld probes and transesophageal probes. The Sonos blom7500 is equipped with a standard array of S and X series 2D handheld probes as well as an X4 3D handheld transducer. The IE33 is equipped with both a state of the art X7 3D handheld probe and a cutting edge Philips 3D TEE probe prototype. Within this facility there are over 20 state-of-the-art computers in the laboratory including 4 multi-core high performance desktop image processing platforms and extensive large-capacity data storage solutions. All have the latest Intel or AMD multi-core processors, run Windows XP Professional, and are connected to a lab-wide intranet that allows for data archiving and file sharing. Three computers are installed with the most recent TomTec Research Arena software – this software interface allows visualization and analysis of fully four-dimensional echocardiographic data sets and includes specific modules that allow for automated LV contour detection, parametric imaging and dedicated quantitative MV characterization. Two computers are installed with proprietary research versions of Philips QLAB image processing software which includes segmental and parametric LV analysis packages as well as valvular analysis and speckle tracking modules. The Smilow Center for Translational Research and the Cardiovascular Insitute provides easy access to both large and small conference rooms as well as large auditorium space–all of which have access to AV equipment and video feeds from animal and human operating rooms. 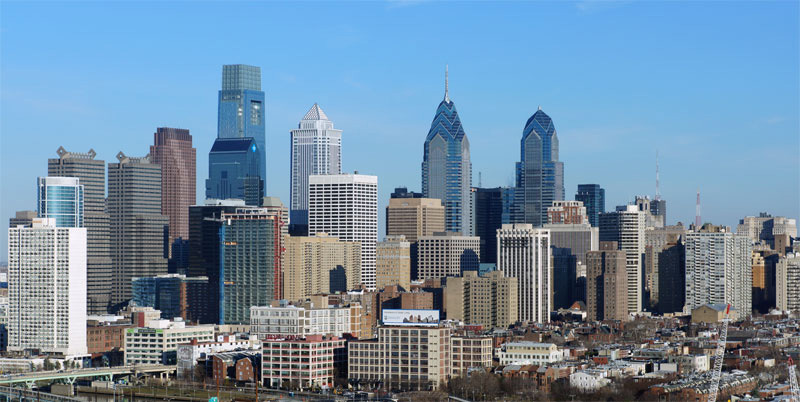 The facility is located next to a major commuter rail line and highway access–providing multiple easy routes to the Philadelphia International Airport (PHL) and other major metropolitan hubs.